After last week’s excitement that I finally had a plan for the office, I was ready to see some actual progress in the room. Ten paint samples later, my dreams of a brighter work space came true. That wasn’t even my favorite part of the week. We also pulled up the horrible, no good, very bad, beige builder-grade carpet. Let the angels rejoice! While we were getting a physical workout removing carpet, the credit card was getting a virtual work out as I made design decisions. I’m pretty sure someone at Visa is rolling their eyes and saying, ‘Oh, that Melissa, she must be doing the One Room Challenge again’. PS: If you’re a new reader, welcome to Polished Habitat! You should head back to week #1 to start at the beginning of this 6 post event hosted by Linda from Calling it Home. The short version is that 200+ people are making over one room in their house. Each week, we all post progress updates until the final reveals on 11/10/17. I’m one of those crazy people who take part in the event each spring and fall, even though it usually makes me cry. Thankfully, I found some great deals that are helping out with the budget. Check out these gorgeous curtains from West Elm. I lucked out and spotted them when the 108″ version was still available at the crazy cheap clearance pricing. Late night shopping win! They’re looking great in the updated mock up. 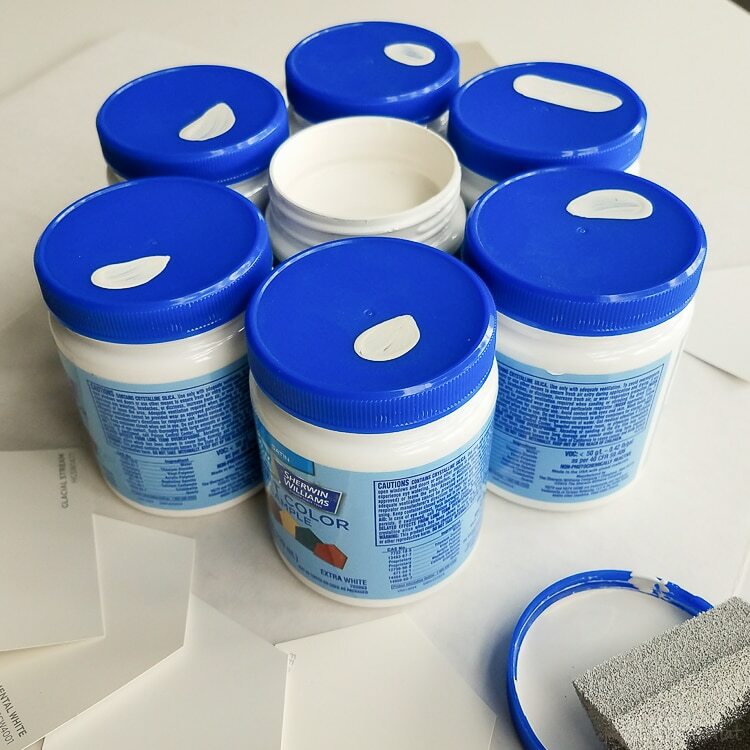 For the hard work part of the week, I started with lots of paint samples. I’m pretty sure the paint man at Lowe’s thought I was insane. They all looked the same when he blotted the color on the lids. I might have questioned my sanity a bit too, but on the walls they were definitely different. I figured out quickly that I only thought I wanted a bright white. Our “white” trim looks yellow against the brightest whites. Seven samples and I wasn’t crazy about any of the options. After lots of Googling, I decided to try Sherwin-Williams Repose Gray. I almost loved it, but it was a tad too dark. I took a 3rd trip back to Lowe’s and I asked for another sample of Repose Gray, but asked them to lighten it to 50%. I also picked out another light gray. Because if you are going to have 9 test colors on the wall, you might as well make it an even 10. As I was testing paint, we were also clearing out the space. Before we took the bookcases and desk out of the room, we tried out the bookcase by the window. It’s going to work perfectly! Woo hoo! Repose Gray lightened to 50%!!! It wouldn’t be a challenge if a normal color worked in the room, right? We spent Saturday painting, and by the end of the day I had a happy bright space. Hooray! The paint was only the 2nd most exciting thing that happened in the room this week. Sunday, the carpet channeled Justin Timberlake and went Bye, Bye, Bye. The carpet departure left us with chunks of padding stuck to the foundation. And the carpet tack strips were nailed in every 5ish inches all around the room. Every time we pulled out a nail, a chunk of foundation came up with it. But who cares. The carpet was gone! We got that mess cleaned up and can’t wait to start the next step tomorrow. We are starting the herringbone floor! By next week, we should have the floor and new baseboards done. I keep forgetting to mention the baseboards, but we’re going with a taller, more modern version. I’m hoping we can knock that out by Sunday. If I’m lucky, we may get the ceiling fan and curtains installed by next Thursday’s post too. Things are getting exciting! It feels like a lot, but I think it’s doable as long as this next week goes as planned. Fingers crossed! Don’t forget to pop over to Calling it Home to see the rest of the One Room Challenge participants and check up on their progress! BIG project! That wall of paint samples is hilarious. Can’t wait to see how the floor turns out! 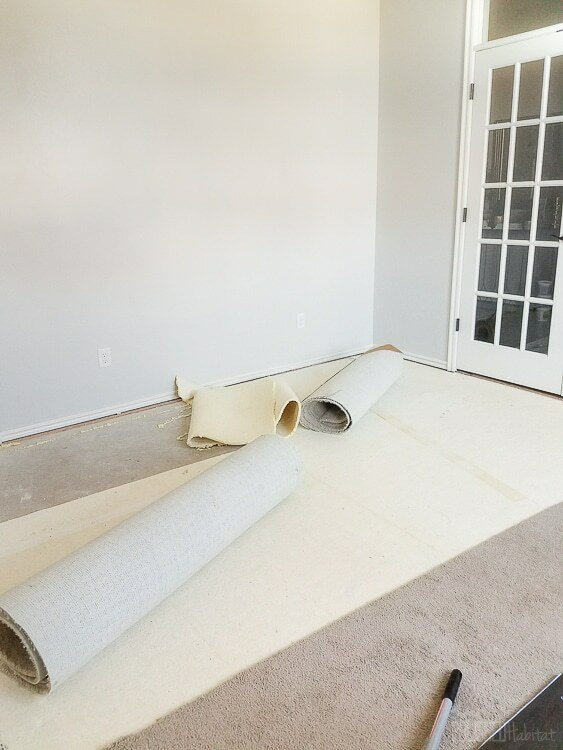 What a difficult job taking out the carpet …I can’t wait to see that beautiful floor. Have a good weekend. I hesitated whether to say anything, because who in the midst of the ORC needs MORE work? But, I think since you are going to the trouble of changing the baseboards and beefing them up (which I think will be great btw), I think you might want to consider also beefing up the door casement molding as well. I think it will add more presence and better scale to the room. 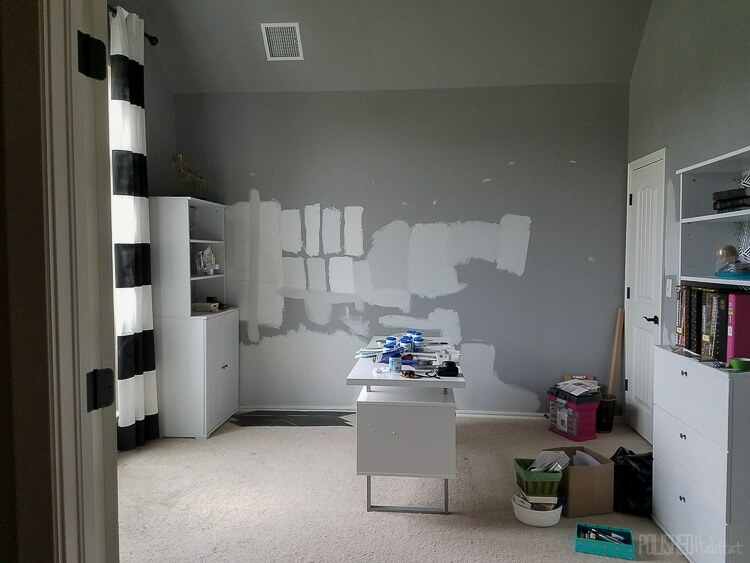 The Makerista has some really great before and after pictures this week of the difference it made in her room. And congratulations on picking a paint color! Thanks, Mary! We definitely agree with you! The only hesitation is that the closet door was built so close to the corner of the room that there is only about 1/2″ of drywall between the existing casing and the corner. It’s so odd! We still haven’t ruled out coming up with some kind of solution though. And I agree with you on The Makerista’s before and after pictures – gorgeous!! Love how the paint turned out! 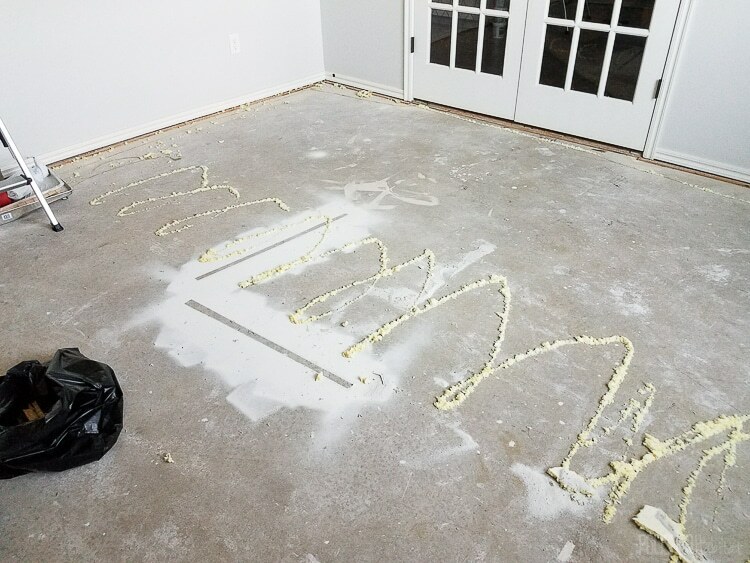 Good luck with the floors! 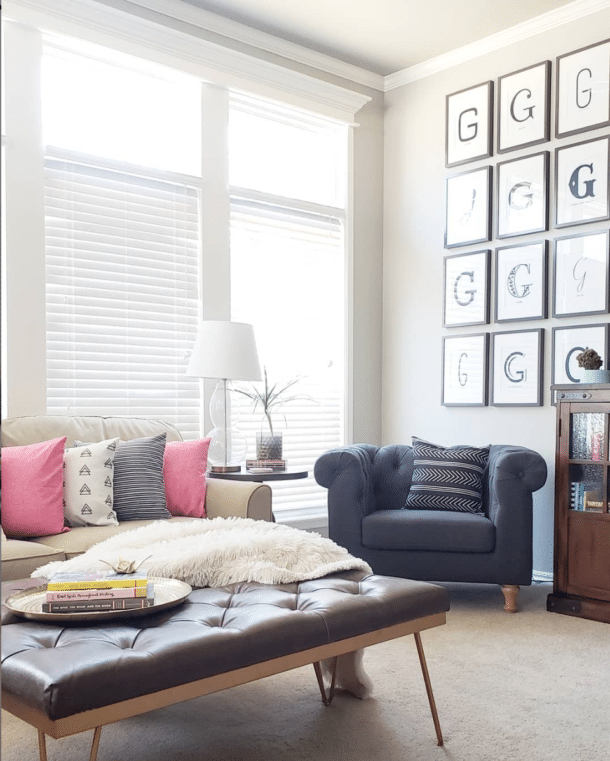 Finding the right paint color is a challenge in itself! Love the color you picked. I bet you’re so glad that carpet is gone. I cannot wait to see the herringbone floor! I am! The garage man hauled all the carpet away this morning, so it’s out of our lives for good. Hooray! I love the pink and gold your working in there! This is going to be beautiful! Look foreword to the reveal! Melissa, I love reading all about your progress and your paint choice was perfect!! Dying to see next week – and, this is my first and although I have already cried, am already looking forward to spring! I’m so glad you’re loving the process, Kelley! It’s so addictive. Even when it makes you cry. I am cracking up about all the paint samples on the wall because this is exactly what my house looked like when we were building. I think I had 20 paint samples on the wall. But it’s SO IMPORTANT to get the right one. Loving watching the progress on the room and can’t wait to see more! Glad it’s not just me with the paint! I’d spend a fortune a samples if it avoids having to repaint. 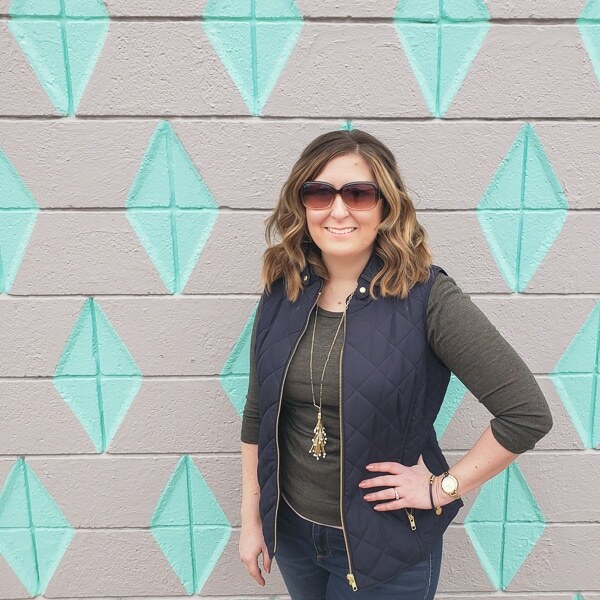 Melissa, I am so excited to see how your office is progressing and what so relieved that I am not the only one who struggles making color decisions. It certainly looks like you chose the right color…it’s lovely. And i can’t wait to see how your floor looks this week. Hope you are having a wonderful, yet productive, weekend. Thanks so much, Lynn! The floor turned out better than I expected and I can’t wait to show it off in the week #4 post! The new paint color is gorgeous! What a difference! I love the progress you’ve made and can’t wait to see more! I can’t wait to see the herringbone floor! Love the floor sneak peek you shared on Instagram and can’t wait to see how it all comes together!!! Oh, boy! Your credit card needs to get ON the ORC bandwagon! Haha sounds like we went through the same gray paint debate. Can’t wait to see how your room turns out! I know! Gray paint is so hard! Finding the long drapes you needed on clearance is quite the score! 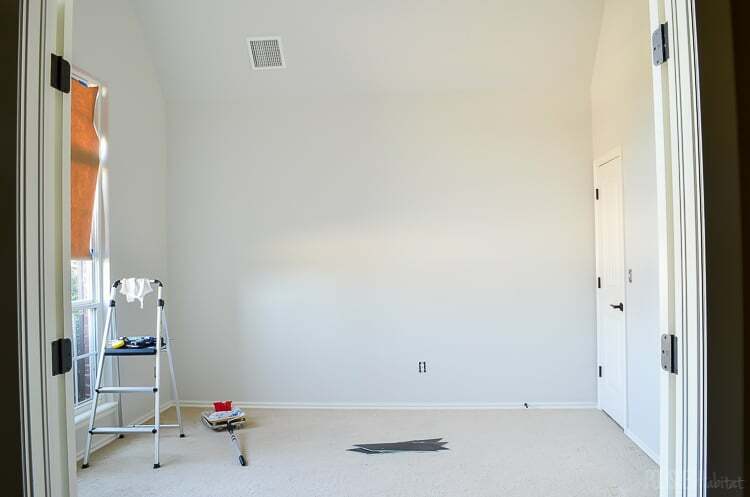 I love the wall color you ended up with, and the only thing I can think of that would be better than that carpet being GONE is if Justin had been there to deal with all that glue! Always with the big projects Melissa! I can’t wait to see how it looks. That carpet sounds like a pain! Thanks, Stephanie! Getting rid of the carpet was totally worth it! The repose lightened 50% is perfect! And I laughed so much about you saying the paint man must think your are crazy. The local paint store knows me by name because of experiences like this. I’m not sure that’s a good thing. The curtains are also beautiful. When I went to get the 50% sample, it was a young new guy and we had to have a staring contest. He had no idea they could custom mix things like that and was so confused. He started to tell me he couldn’t do it, but I think my intense look made him realize I was more confident that they could do it than he was that they couldn’t. LOL. Ha ha! LOVE all those paint samples. You gotta get the right color though, and I love how the 50% lightened Repose Gray looks in there. So nice and bright. We have builder grade (stained) carpet all throughout our house, and as soon as our wallet allows, I’m ripping it out for something more kid-friendly. The new wall color looks great and I can’t wait to see the new flooring! !